From the Cecil Whig, Maryland USA: Toby, a 2-year-old golden retriever, is all over the news after saving his owner’s life by performing the Heimlich Manoeuvre on her. 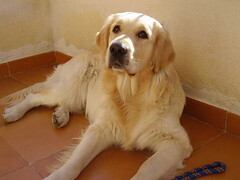 A Creative Commons Golden Retriever (not Toby) from flickr. Photo by jarapet.